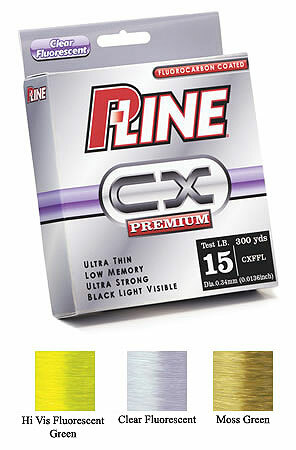 P-Line's CX Premium Fluorocarbon Coated Line is one of the most innovative lines available, combining copolymer and fluorocarbon technologies. With low memory and improved limpness, CX Premium eliminates the line nightmares of a spinning reel, and improves casting distance with a baitcasting reel. The fluorocarbon-silicone coating virtually eliminates water absorption, so cold water and weather have little effect on line performance. With as much as 30% less stretch than average lines, it has increased sensitivity to detect and react to even the most subtle strikes.